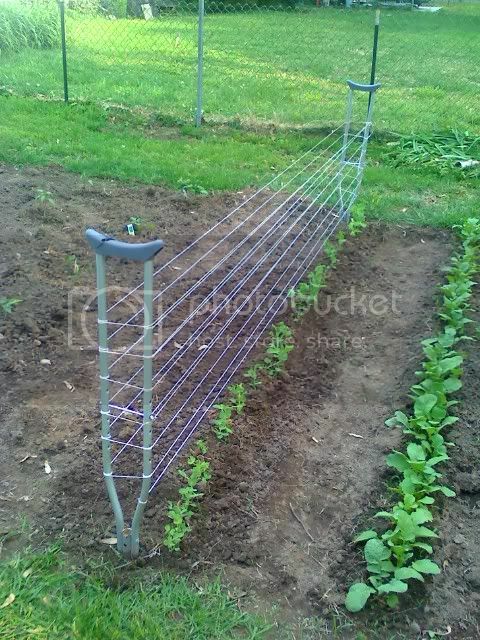 As they say in the gardening business "Break a leg". That is awesome though I love the originality, a lot of us on here like to reuse, reclaim, recycle whatever we can. I think you may have "broke" into new barriers though. That looks to be ideal maybe I should start marketing this kind of thing. That is so awesome! Made me laugh at first but it's brilliant! Good call!!! I am in a bit of a pea crisis right now myself and I have some spare crutches laying around too. Sadly, it's too late for me to use this idea, I will next year tho, guaranteed! lol....good idea. Hope it doesn't become a crutch for you. lol nice one, i would make the strings go to the top though, they will easily climb that far. ours get 8 ft trellis and end up about 7ft.